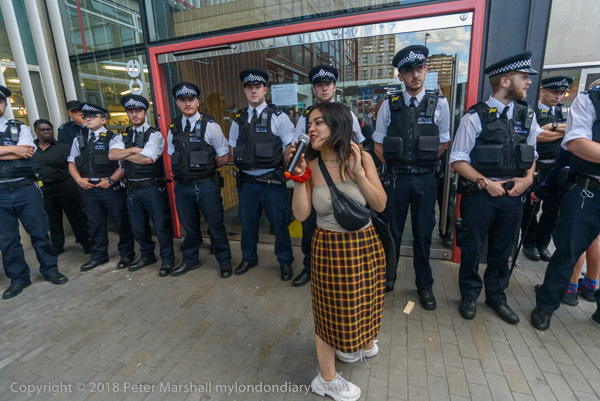 It’s rather a cliche, but I still like it, the one protester and the line of police protecting the status quo, in this case the London College of Communication. But of course it isn’t the whole story and turning my camera around roughly 180 degrees shows a very different picture. 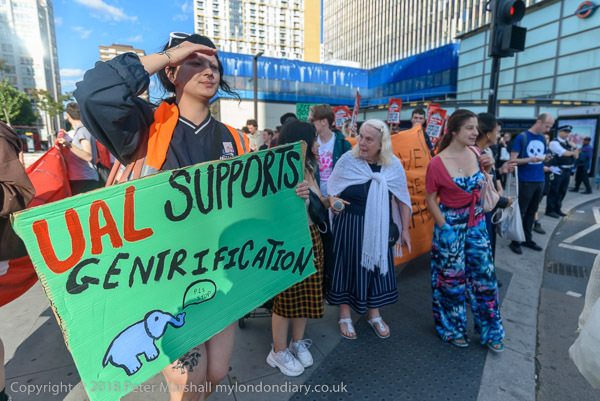 The fight was not so much to save the Elephant & Castle as it currently exists, but to see it developed in the interest of the community who currently live around and use the area, particularly the small market traders, the Latino community and the local residents, rather than a ‘regeneration’ that benefits the developers, the big businesses that will open their shops in the new centre, and the overseas investors who will buy many of the new flats simply as investments rather than for people to live in. 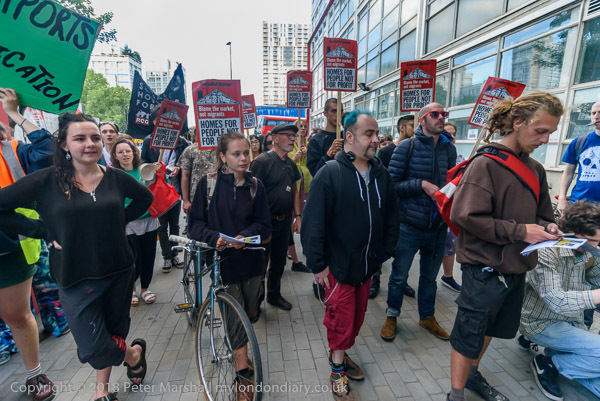 And while the University of the Arts will get improved facilities (their current building dates from when the London College of Printing moved here in 1962), the education that working in a vibrant community provides for its students will be lost. 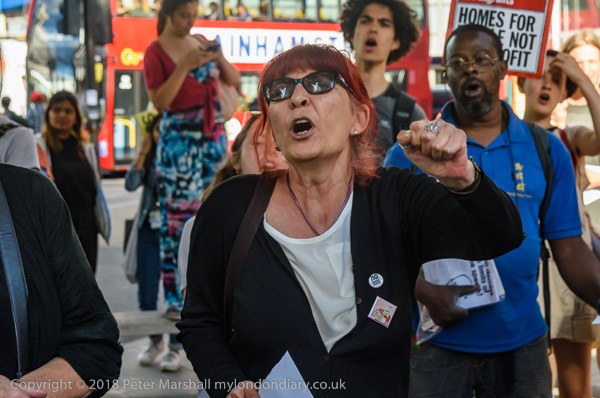 The struggle to improve the plans continues, even though Southwark Council narrowly passed the plans following some minor concessions made by the developers to meet the demands made by the local campaigners. But unfortunately the new shopping centre, though almost certainly more attractive looking than the currently widely despised building, will probably have all of the sterile emptiness of Westfield, though on a smaller scale, attracting people from a wide area rather than serving the locality. Built in the 1960s, when it opened in March 1965, it was hailed as the first covered shopping mall in Europe and argest and “the most ambitious shopping venture ever to be embarked upon in London”, but was hampered by budget cuts. Although inside it now seems rather small and claustrophobic compared to more recent malls, but is on a more human scale, and has shops that serve local needs, as well as a thriving market that has grown up around it, in particular with over a hundred small Latin-American businesses. I think everyone agrees that some redevelopment of the centre is necessary, but any local authority that truly represented its residents would have made strenuous attempts to protect the interests of these and other local businesses, insisting that the developer provide a similar amount of low-cost market space in the new development. But all that has been provided, even after the protests are some rather vague promises and a small relocation fund. The protests have also resulted in a some increase in the number of affordable homes in the development, although only around 12% of the 979 residential units will be at ‘social rents’, and the overall proportion of 35% ‘affordable’ properties is likely to be reduced by fancy accountancy during the construction which will allow the developers to claim this ‘impacts viablity’, reducing their profits below an exorbitant 20%. 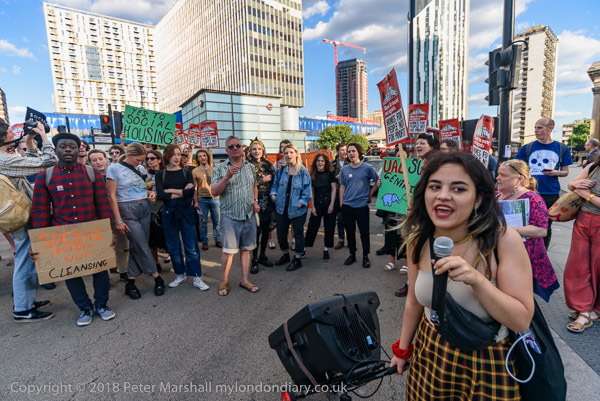 Southwark Council has a long history of scandalous so-called ‘regeneration’ projects, selling off the interests of its local population to developers at cut-down prices, including the demolition of the Heygate Estate and the currently continuing demolition of the Aylesbury Estate and other schemes elsewhere in the borough. Unfortunately the Labour dominated council is still dominated by right wing ‘New Labour’. This entry was posted on Wednesday, October 24th, 2018 at 09:50 am and is filed under My Own Work, Photo Issues, Political Issues. You can follow any responses to this entry through the RSS 2.0 feed. You can leave a response, or trackback from your own site.